Final Installation of the 67C on Pole C will be on Sunday Sept . 19th. (10 AM). We look forward to your help! If you can make it, please post to the mbara email reflector. We will also be installing the Sat antennas on top of pole L soon. Lots has happened since our last update. Operating rooms #2 and #3 have been upgraded with additional equipment providing working KW HF stations in each room with logging computers. (Thanks to KG6KCO for the computer help.) 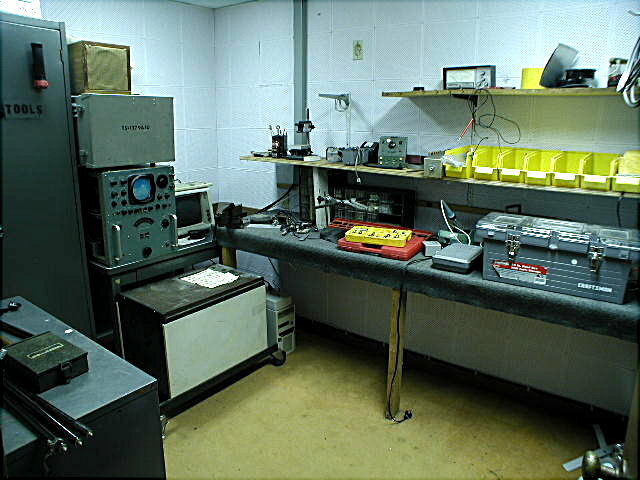 Room #1 is now clean and empty and is currently targeted as a VHF/UHF operating room and as a back up HF room. The main meeting room is now completely cleaned up. Chris, K6PIC, has installed new 40M and 60M dipoles and an experimental horizontal 1000 ft loop circling the property (fed by the open wire tuner in Room #2). The loop promises to be a great low band performer! Chris had help installing the loop from WA6HHQ and AC6DN. New pictures of the rooms and the site are on our pictures page. WA6HHQ is donating a Pro-67C Yagi (3 elements on 40M through 10M) which is currently targeted for installation on the 60 ft pole 140 feet north of 20M 4 el Yagi. (See our pictures page for details.) Once it is up we plan to take down the small tri-bander on the temporary military tower, which will eliminate its interaction with the 4 element 20M Yagi. (They are less than 20 feet apart.) Installation should happen next month. We are also investigating installing our Rohn 25G tower sections on one of the 3 ft x 3 ft cement pads located 150 ft outside the security fence. See the pictures page for details. We currently have about 60 feet of tower and are looking for another 20-30 ft, including a flat top tower section. We are also looking for one to two medium duty rotors, Ham - M / IV size. Please contact us if you can help out with any of the above or are interested in helping with the install. We now have three clean, open operating rooms ready to go. Also see our pictures page. As part of our N6IJ station clean up and upgrade, a number of us descended on the station last night for a major station clean up, junk removal and to install new workstation corner tables in operating rooms #2 and #3. Chris -the 'Night Owl'- Knight, K6PIC got an early start by arriving at 12:01 AM Thursday morning and spent 6 hours totally emptying rooms #2 and #3 into the main lounge. This was a superhuman effort that really helped get us off to a successful start. Thanks Chris! Nine of us arrived (including Chris) at 6PM (Chris - when do you sleep?) and after marveling at the huge pile of equipment, parts and old furniture in the main meeting room, we proceeded to eat Pizza (thanks Kim!) and then spent the next 5 hours removing most of the older items, metal desks and magazines, totally cleaned out the rear shop / repair room and vacuumed and cleaned all of the rooms. 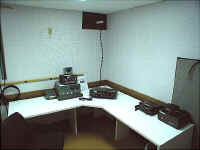 We then installed the new tables in #2 and #3 and also brought up new HF and VHF/UHF stations in Room #2. 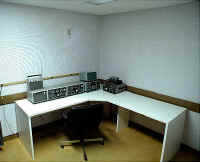 We even had a little time at the end to work some European DX on 20M with the new equipment in room #2. Our goal was to open up the rooms for easy use and ease of installation for new rigs. 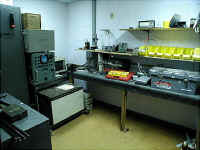 Hopefully the station is much easier for members to use and to bring in their own equipment for temporary use in contests, DXing or just regular operating. Those of you who have visited the station before will be pleasantly surprised at how open and clean the whole facility is now. Now on to the antennas! There is still a lot to do. We're looking for more current HF equipment and antennas, another corner workstation for Room #1 similar to those in rooms #2 and #3, and also for some used Pentium class laptops for logging etc. 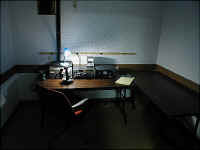 Please email us to discuss any extra equipment in your shack that you would like to loan or donate to N6IJ. Thanks to everyone who made it! We originally weren't planning on making this a big effort, but the surprise arrival of everyone made it a huge success.